Tony uses his design ability and craftsmanship to build custom pieces that are not only functional but have an artistic flair. Many of his pieces have an art deco/mid-century look. 24” x 54” Solid Elm Desk with Chrome Column. 18" x 108" Solid Elm Bench with 3/4" Glass Leg. 54" x 36" x 15" Fused Glass Table. Maple Top with Live Edge and Fused Glass Panels in Chrome Frame. Detail Image of Fused Glass Table. 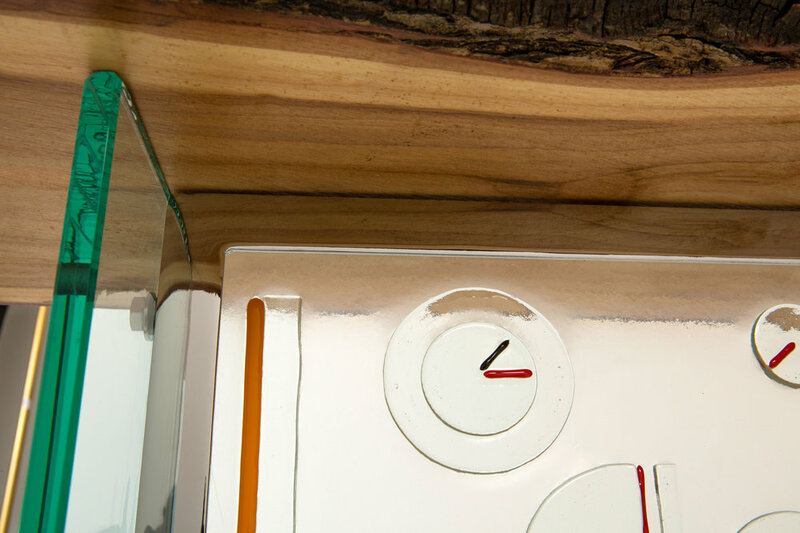 Detail Image of Fused Glass Table with Maple Top. Coffee / End Table. 24" Round x 20" High. Solid Walnut with Chrome Base. Modular Shelving. Polished Aluminum and Carmelized Bamboo. Walnut Entertainment Center with Storage Drawers and Concrete Top. 8’ x 7’ Dual Sofa Tables. Solid Walnut. 9’ Hall Table. Walnut Top with Live Edge. Black Base with Chrome Inserts. Family Wall. Walnut Bench with Live Edge. Chrome Plated Sign: “Truckee Love”. Black Wood Mosaic Background. Jewelry Display Stand. Maple Burl. Jewelry Display Stand. Walnut Burl.